Powers/Abilities: Lorelei can generate hypersonic pitches through her voice that effect the sexual drives of human males, paralyzing the males when they hear her and completely paralyzing them. Her powers are ineffective on females. (X-Men I#63 (fb) - BTS) - Using untapped radiations in the Savage Land, Magneto built a machine and turned several of the local indigenous people there into super-powered Mutates (Amphibius, Barbarus, Brainchild, Equilibrius, Gaza, Lupo, Piper) who were loyal to him. (X-Men I#63) - While the Mutates fought the X-Men (Angel (Warren Worthington), Beast (Henry McCoy), Cyclops, Iceman, Marvel Girl (Jean Grey)) and Ka-Zar, Magneto developed another Mutate, Lorelei. He used her to enthrall all the male heroes with her voice, but Marvel Girl remained free. Marvel Girl used her telekinetic powers to fight Magneto and destroy the machine, and the Mutates reverted back to their savage states. (X-Men I#62) - Magneto, using the name Creator, introduced the captive Angel to Gaza, Amphibius, Barbarus, Lupo, and Brainchild, then, having convinced Angel that the Mutates were rejects from their various tribes, sent Angel to stop his teammates. (X-Men I#63) - The Mutates (except Brainchild) followed Angel and attacked Ka-Zar and the X-Men. Despite his added strength, Barbarus was quickly knocked out by blows from the Beast. The heroes managed to defeat new Mutate Lorelei, and Marvel Girl managed to destroy the mutator machine, and the Mutates were reverted back to their savage states. Magneto was believed dead and the heroes departed. (Avengers I#110 (fb) - BTS) - Magneto returned to the Savage Land and restored the Mutates' powers to them, though they had no memory of him doing this. (Avengers I#105 (fb) - BTS) - A group of Mutates (Amphibius, Barbarus, Brainchild, Equilibrius, Gaza, Lorelei, Lupo) kidnapped some scientists from South America and returned them to the Savage Land. They hoped to use the scientists to create more Mutates. (Avengers I#105) - When the Avengers (Hawkeye (Clint Barton), Iron Man (Tony Stark), Scarlet Witch, Vision), Black Panther (T'Challa), and Sif came to the Savage Land to investigate. They swiftly defeated the Mutates, so Equilibrius summoned Lorelei who enthralled all the men with her song. Scarlet Witch and Sif prepared to attack her, but Vision (who was resistant to her powers) knocked her out instead. The Avengers retrieved the scientists and departed. 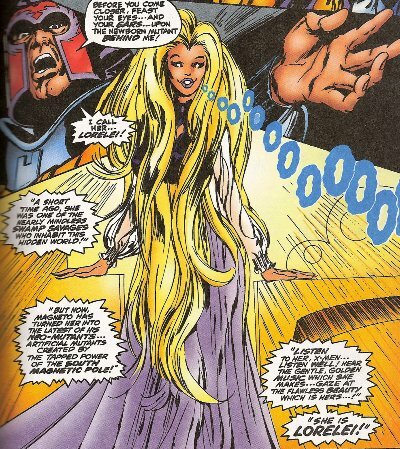 (Defenders I#15 (fb) - BTS) - Magneto recruited Lorelei, of whom he had grown quite fond, and Blob, Mastermind, and Unus the Untouchable to form a new Brotherhood of Evil Mutants. (Defenders I#15) - The Brotherhood worked with Magneto to form Alpha the Ultimate Mutant when they were attacked by Professor X and the Defenders (Doctor Stephen Strange, Hulk (Bruce Banner), Nighthawk, Valkyrie). Lorelei mesmerized Professor X and Nighthawk with her song, but Professor X managed to turn on Nighthawk's jetpack and he crashed into Lorelei, stopping her. Alpha then awakened. (Defenders I#16) - Alpha fought the heroes then sealed them in the cavern, teleporting the Brotherhood to the United Nations at Magneto's instruction. Magneto delivered an ultimatum to the dignitaries there to grant mutants power, but the heroes attacked again. Alpha, who'd been slowly evolving, judged the Brotherhood to be evil, however, and reduced them to infants. (Uncanny X-Men#104 - BTS/Champions#17 (fb) - BTS)/Super-Villain Team-Up I#14 (fb) - BTS) - Eric the Red (Davan Shakari) restored the infants into adulthood on Muir Island, where they'd been kept by Moira MacTaggert. (Captain America I#415 (fb) - BTS) - Back in the Savage Land, Lorelei partnered herself with the High Technician, a former pupil of the High Evolutionary who had been employed by A.I.M. to assist in mining the Savage Land's Vibranium. The High Technician used his former master's devices to "evolve" local dinosaurs into humanoid servants for A.I.M. When Ka-Zar discovered the operation, he was turned over to Lorelei and mesmerized to serve them. (Captain America I#415) - The Falcon came to the Savage Land alongside Captain America and other allies. Discovering the High Technician's fortress, he met Lorelei and the High Technician, and Lorelei seemingly placed him under the control of her powers (however, the Falcon's infra-red lenses shielded him from Lorelei's power, and he feigned servitude). (Captain America I#416) - The High Technician showed the Falcon around his facility, and explained his partnership with A.I.M. He ordered the Falcon to bring his friends to them so that Lorelei could use her powers on them as well. The Falcon returned with Captain America and Diamondback, but before Lorelei could use her powers the Falcon warned his allies; Diamondback threw a tear gas diamond at Lorelei to disrupt her concentration, then struck her unconscious. (Captain America I#417) - A.I.M. sent their agent Macross in the armor of Terminus to collect the High Technician. Lorelei remained unconscious as the High Technician was taken away. (Cable & Deadpool#49 (fb) - BTS) - Brianchild led the Mutates (Amphibius, Barbarus, Lorelei, Piper) in taking over Magneto's old base. From there, he planned to use the technology to disrupt electrical signals all over the world and expand the Savage Land's prehistoric dominion. Deadpool captured Shanna, had Lorelei subvert Ka-Zar's will, and had Piper surround the base with dinosaurs and take over Zabu. (Cable & Deadpool#49) - Deadpool and his allies Weasel and Bob the Hydra agent stormed the base, where Lorelei ordered Ka-Zar to stab Deadpool through the head, though his healing factor quickly repaired him. Lorelei then took over Bob and Weasel, but Deadpool, with a knife through his ears, was immune to her powers and managed to knock her down, freeing the others. Piper and Lorelei went running for it and Brainchild sought to stop the heroes. Soon, the Mutates sought to escape on the back of pterodactyls. Amphibius and Barbarus got safely away, but Deadpool shot the pterodactyl carrying Brainchild, Lorelei, and Piper, and left them falling into a group of dinosaurs below them. (Marvel Comics Presents II#6/2) - When Roxxon and hired criminals Plunderer (Parnival Plunder), Killer Shrike (Simon Maddicks), Manticore, and Saboteur, as well as several Mandroids, invaded the Savage Land, the Mutates (Amphibius, Barbarus, Brainchild, Lorelei) joined Ka-Zar, Shanna, Zabu, Devil Dinosaur, Moonboy, and Stegron in fighting them off. Brainchild was initially reluctant to trust Ka-Zar until he reminded them of the seriousness of the stakes. A deadly battle broke out and a lot of Stegron's dinosaurs were killed. (Marvel Comics Presents II#7/2) - Using a device that Brainchild had modified, Stegron revived the dinosaurs as zombies and battle resumed. The tides quickly turned when Lorelei took over the minds of the male enemies and Roxxon was quickly chased out of the Savage Land. Comments: Created by Roy Thomas, Neal Adams, and Tom Palmer. 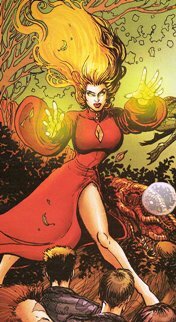 Lorelei has an entry in the Official Handbook of the Marvel Universe Deluxe Edition#11 and the Marvel Encylopedia: X-Men alongside the other Savage Land Mutates. 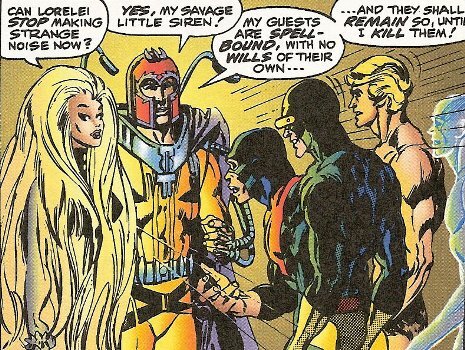 Thanks to Will U for pointing out Lorelei's real name, which was revealed in the Brotherhood of Evil Mutants entry in the Official Handbook of the Marvel Universe I#2.